The Great Mouse Detective | WHAT A FEELING! Walt Disney’s The Great Mouse Detective is easily the legendary studio’s most satisfying animated feature since—well, who knows how long it’s been? Observers have charted the decline of Disney, and of the animated feature in general, for so long, it’s difficult to remember the last time anyone spoke of a Disney cartoon with real admiration. After last year’s ambitious (but unsuccessful) The Black Cauldron, Disney desperately needed a hit. They went so far as to test-market the title of their next feature, which throughout its long schedule of production (animated films are years in the making) was known as Basil of Baker Street. 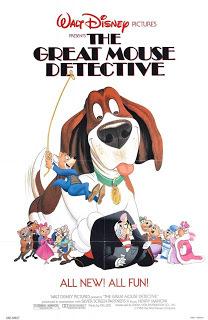 Sorry, Basil, the market researchers say that The Great Mouse Detective is a more appealing title (even if anyone with an ounce of sense knows it isn’t). Whatever its title, the new Disney shapes up as a much-needed pride-booster for the animation department. It’s lively, scary, and utterly without the kind of cartoon condescension that assumes kiddies will be unable to follow the most rudimentary story. Actually, the plot of The Great Mouse Detective is pretty rudimentary, but condescension is more a question of attitude, anyway. It’s a Sherlock Holmes story in which Holmes and Watson (called Basil and Dawson) are crime-fighting mice in 1897 London, and archenemy Moriarty is a nasty, effete rat called Professor Ratigan. Professor Ratigan (spoken by Vincent Price, the only big name in the cast) and his icky henchman Fidget (a peg-legged, yellow-eyed bat), kidnap a toymaker for a devious plan involving the upcoming visit from the Queen of Rodentia. The toymaker’s daughter goes to Basil for help, and the rest is elementary. The story is broken down into a series of set-pieces, including a chase in a toy store, a hearty barroom brawl, a nifty bit in which Ratigan snares Basil and Dawson in a seemingly hopeless trap, and the big finale hanging from the clock of Big Ben. There are no dead spots, the animation is atmospheric (if hardly revolutionary), and the scary stuff is good and creepy—not watered down. Before the film is a not-quite-classic Mickey Mouse short, Cleaning Clocks, which shares a few gags with the Big Ben sequence in the feature. It’s oddly comforting to know that, after decades of animated progress, a cartoon character’s head still makes the same CLANNNGGGGG when stuck inside a ringing bell. The Little Mermaid deservedly gets credit for turning things around for Disney, but this was the tip-off: a really smart, crackling entertainment from (of all people) the Disney animators. You can tell from the tone of this piece how unlikely that seemed at the time, and what a low point “family films” had reached. Things changed. This entry was posted on Wednesday, March 13th, 2013 at 3:00 am and is filed under 1986, Actually Good 80s Movies. You can follow any responses to this entry through the RSS 2.0 feed. You can leave a response, or trackback from your own site.